It doesn’t matter if you drive a rust bucket or luxury four-door, your car is probably one of the most important/priciest things you own. Yet instead of guarding it with your life, you drive it at high speeds on an obstacle course full of unpredictable hazards and bad drivers. And like it’s no big deal. Crazy, right? Since most drivers don’t bubble wrap their cars, car insurance is the most logical AND practical way to protect your vehicle. Our independent insurance agents will walk you through a sweet selection of policy options to make sure you have the right coverage. In short, it’s a contract between you and an insurance company. The insurer will help you recover financially from a number of scenarios that involve bad things happening to or caused by your car. Bad things can range from medical expenses to roadside assistance. In almost every state, it’s illegal to drive without car insurance. Every state has a minimum of liability coverage that is legally required. If you don’t have it, you could be fined. If you make a habit of getting caught without it, you could end up in jail. The other good reason to have car insurance is consistency. It’s easier to pay monthly or quarterly premiums than to swallow the sudden cost of a bad accident. Unless you have an emergency stash of cash lying around, you should get yourself covered. 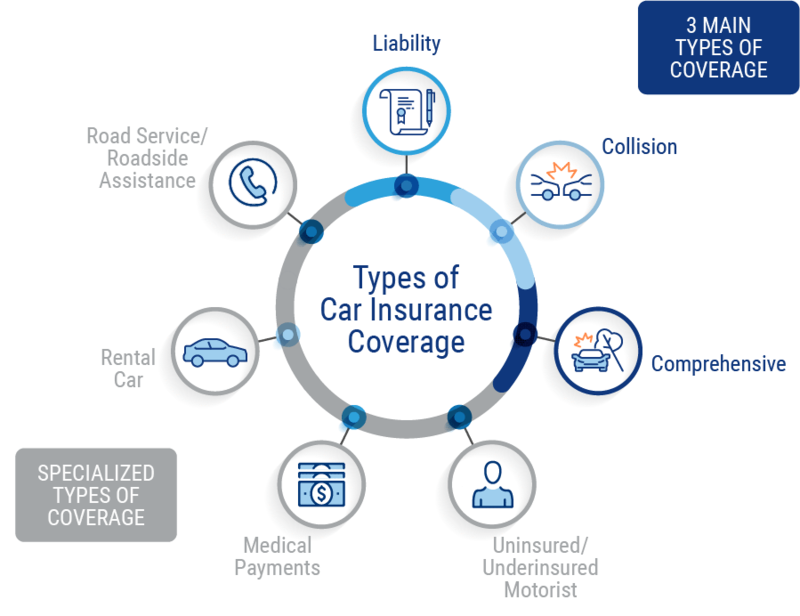 What Types of Car Insurance Coverage Do I Really Need? On the other hand, if you absolutely must have your car for work, dropping off your kids, or other mission-critical tasks, consider adding the other types (especially rental car coverage). They’ll help you cover bills and other expenses to get you back on the road. An average driver with a good record will likely pay about $800 a year for full coverage for one car. If they choose liability coverage only, costs could be as low as $600. Auto insurance costs are based mostly on the coverage you choose, the value of your car and your driving history. Driving a luxury car and getting DUIs or other violations will push costs higher. Your rates will drop as you get older, especially after turning 25.
Who Is Included in My Car Insurance Policy? Family members who live at your address and share your car (such as a spouse, partner or teenage kids) should be explicitly covered by your policy. If they have a bad driving record, it can drive up your costs. How Can I Get Car Insurance Discounts? Our agents simplify the search process for finding the right car insurance. They’ll walk you through handpicked policy options and explain the nitty gritty in language you can understand. Plus, carriers can have strict deadlines for filing claims. Your independent insurance agent can help you file on time, so you can maximize your insurance benefits. Our agents work with you one-on-one to evaluate your risks and help you decide what car insurance is right for you. Based on your unique needs, they’ll shop and compare policies from multiple insurance carriers. And find awesome protection at the best possible price. We know what you’re looking for: fast and easy car insurance quotes in 30 seconds or less. We get it, you want the goods ASAP, but choosing speed over accuracy can wind up costing you. Quick quotes are great, but online companies might leave out cost-cutting options. And leave in factors that assume higher risk, resulting in a pricier policy. Not only that, our competitors might sell your info to multiple companies, which can result in a flood of calls. We flipped the script by giving YOU the info and options to connect with an independent insurance agent.